It doesn’t sound that much: twenty minutes a day for playing the piano. But it becomes a real struggle to sit down every morning and try to learn Chopin’s Ballade No. 1 within a year and perform it in front of an audience when you are Alan Rusbridger, then editor in chief of the Guardian at a time when news seem to be breaking for weeks on end. But he manages to squeeze practising the piano into his incredible schedule most of the time even when there are such topics as the publishing of the WikiLeaks files and the hacking scandal of “News of the World” that hit every news all over the world, and everything in between from meetings and conferences to editing a newspaper with working days that end in the early hours of the next day. So what seems to be insane is in fact very healthy for the brain and the body as a whole because while playing the piano, the brain has to concentrate on the very moment, the keyboard, the fingers, the notes so that everything else is shut out. “With other people it’s yoga, or a run or a burst in the gym. Twenty minutes on the piano have the same effect for me,” writes Alan – twenty minutes as a preparation for another stressful day. 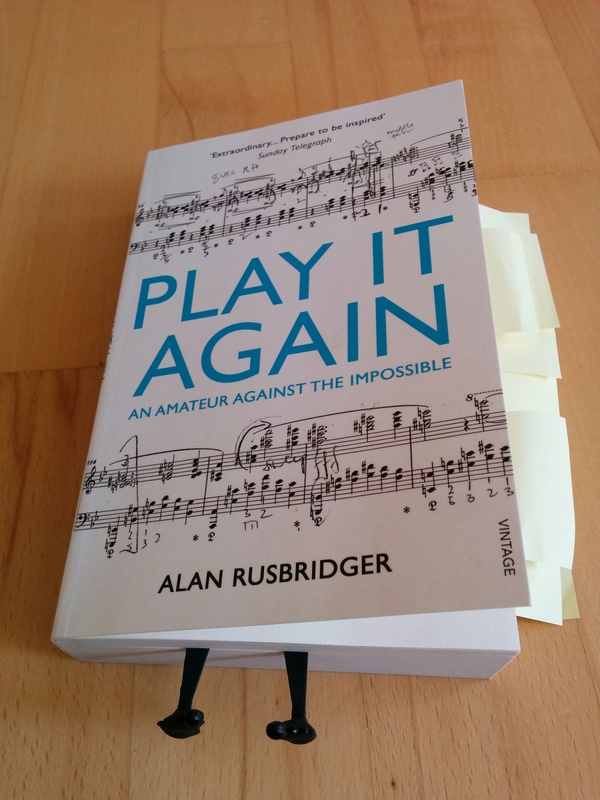 And “Play it again” is also about Rusbridger’s struggle with the music, his doubts about his abilities to get the notes right or remember them at all and it is an inspiration for those of us who always want to go for a run, a swim or just reading a book instead of being bored by telly. They can do it. We all can. Deutsch: Play it again – Ein Jahr zwischen Noten und Nachrichten, Secession-Verlag, 25 Euro. yoou ciuld hel them greatly. Awww. Thank you for the link to my blog.